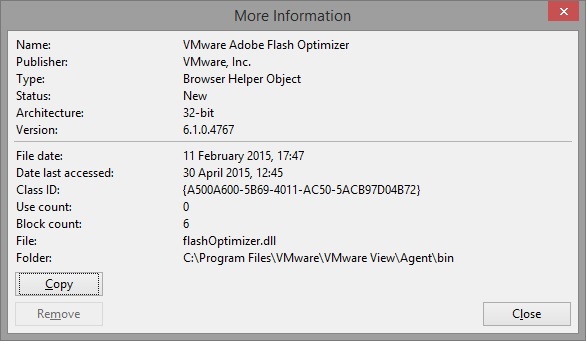 The VMware View Agent which is installed in all virtual desktops (and RDS hosts) managed by Horizon View, includes the VMware Adobe Flash Optimizer internet explorer add-on. This IE add-on is provided so the View administrator can control the flash settings for all virtual desktops in the desktop pool to optimize them for a VDI environment to improve bandwidth. 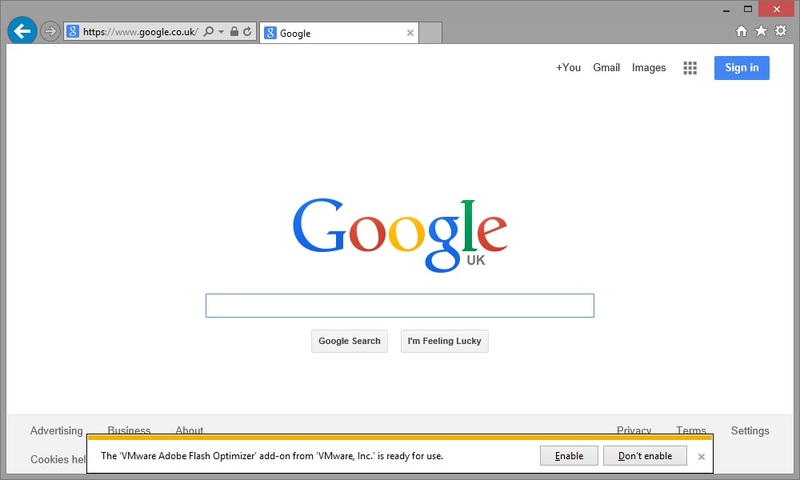 When a user opens Internet Explorer they will be presented with a prompt requesting if they wish to enable or disable this add-on. If you as the View administrator wish to control the flash settings based on the desktop pool setting, giving the user the option to disable this add-on is going to make any of those optimizations unapplicable as the add-on will not be enabled. Additionally the user may not know what to answer, causing confusion and support calls. This should be enabled via group policy so that the user is not prompted and the add-on is enabled. 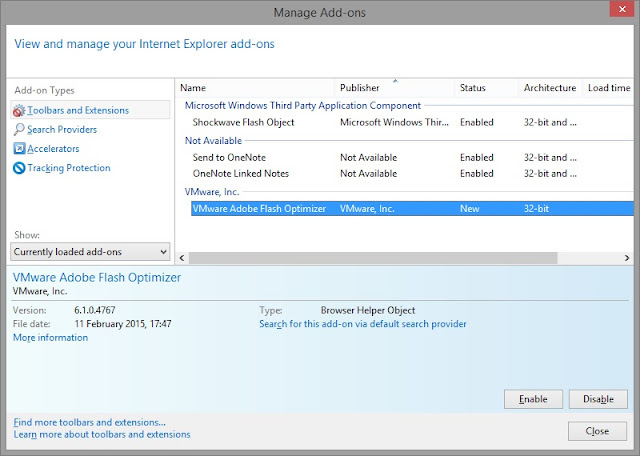 Alternatively you may choose to disable the add-on if you are not using the flash optimization settings. 1. Within IE click on the settings cog image. 3. You will see the VMware Adobe Flash Optimizer add-on with a status of New (or Enabled/Disabled if you clicked one of the options when you opened IE). 5. Note the Class ID and click Copy. 6. Paste the information to the clipboard as below and copy out the "Class ID". 7. Create a group policy object (GPO) for IE or amend an existing one. 9. 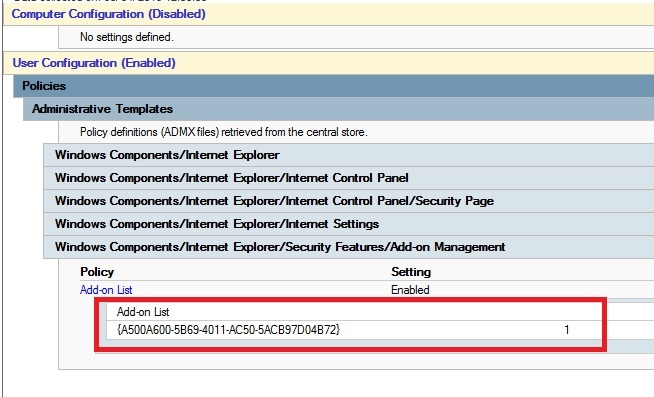 Enter the Class ID and a value to enable or disable the add-on within IE. 10. Apply the GPO to the required OU and perform a gpupdate.